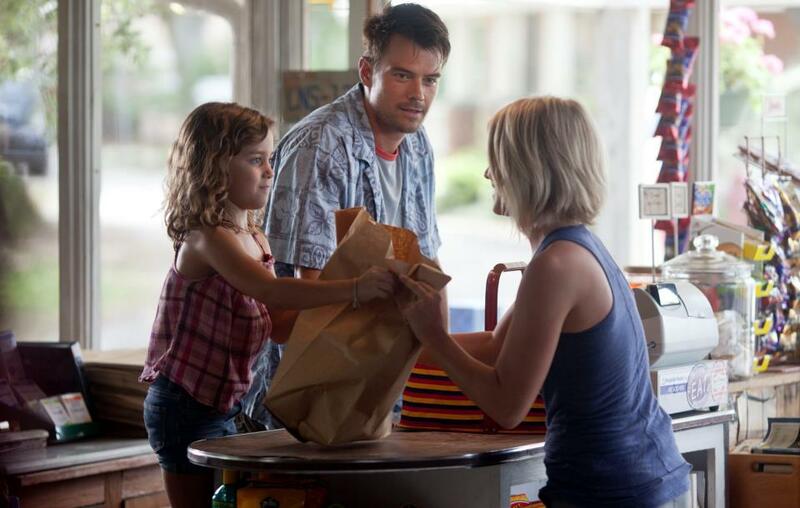 Safe Haven is being released during the Valentine's holiday weekend to capitalize on movie goers looking for an appropriately sappy date movie to cap off their night's festivities. Director Lasse Hallström hit a home run with last year's Salmon Fishing in the Yemen and looks to recreate a similar experience for audiences with the help of Josh Duhamel and Julianne Hough in the lead roles. Hough plays a young woman named Katie who hops on a bus out of town after a life altering event that has her scared for her safety and authorities looking to track her down. Finding refuge in the small town of Southport, North Carolina, her plan is to create a new life while leaving her past buried away back in Boston. Taking on the role of Alex, Duhamel gets to win over the female members of the viewing audience with a charming yet tender performance as a single dad trying to keep his life together. While raising two kids and running the family business has kept the man busy, he is still trying to get over the painful loss of his wife to cancer. Of course the two end up crossing paths and having awkwardly comical moments of getting to know each other before inevitably deciding they should start doing date-like stuff. I mean, this is a romantic feature, so this type of stuff has to take place and as in all of these movies, an issue surfaces that makes the fairy tale story come to a screeching halt and that is exactly what happens here. Unfortunately the sappy love story falls flat and everything else that is thrown is is so weird, awkward, and unexpected that the whole thing becomes an unexplainable mess. Sure Duhamel and Hough fill their roles admirably and Cobie Smulders does solid work with a relatively small yet ultimately important role, but none of it matters when you are constantly confused or disappointed by some plot twists that I can't even begin to explain without going into serious spoiler territory. As I sit here typing away and wondering how this movie could have possibly been any worse, it occurs to me that if you take away a few of the more glaring miss steps, there's actually a decent movie hidden in there somewhere. Its just too bad that you'll be looking to escape the memory of the crime that was committed on the screen in front of you, but you will find that there is no Safe Haven from a movie this bad.